RSMSSB Sanganak Recruitment 2019: After a long time the Rajasthan Subordinate and Ministerial Services Selection Board (RSMSSB) has decided to recruits the well skilled and qualified candidates for the Computer Operator posts through the RSMSSB Sanganak Recruitment 2019 Notification for Rajasthan TSP and Non-TSP areas. The RSMSSB will fill up the vacant posts Application form in the online mode. You can check the more details through the Rajasthan Computer Operator Vacancy 2019. The Rajasthan Subordinate and Ministerial Service Selection Board have been released Sanganak Recruitment 2019 Notification on the official website to fill up the various vacant posts. As per News, the RSMSSB Computer Recruitment 2019 process will be started soon in the online mode. All eligible and interested candidates are invited to participate in the Rajasthan Subordinate and Ministerial Services Selection Board. This is a good job opportunity for those candidates who are searching for Government Job in the Rajasthan state. Candidates can read the whole article for the complete details such as Eligibility, Selection Process, Age Limit, and Salary Pay Scale, how to Apply Online and more details through RSMSSB Recruitment Notification. Huge numbers of candidates are waiting for this recruitment. The candidates who have completed their Secondary and Higher Secondary education will be eligible for the RSMSSB Sanganak Bharti 2019. The RSMSSB Online Application Form 2019 will be available on the official website of RSMSSB Rajasthan. The eligible and interested candidates are advised that they must have to go to the official website and can complete the application process on or before the last date. Candidates are informed that who will complete their Rajasthan RSMSSB Application Form on or before the last date without any mistake, will be eligible to know their syllabus, admit card details. Candidates who are interested with essential qualification can apply online for RSMSSB Jobs 2019 before the last date. For this process, candidates firstly check their eligibility criteria which are given in the below section. Graduation Degree in Mathematics or Statistics or Economics. Certificate of Part-I (ABC) from Indian Statistical Institutes Kolkata. Certificate of Computer Operator & Programming Assistant (COPA)/ Data Preparation & Computer Software (DPCS) from an Institutes under Vocational Training Scheme of State/ National Council. Degree / Diploma / Certificate in Computer Science / Computer Application from a Govt. Recognized University or Institute. Certificate of having Computer Science / Computer Application as a Subject during Sr. Secondary Education from a Govt. Recognized Board of Education. Diploma in Computer Science & Engineering from Govt. Recognized Polytechnic Institute. RSITC Certificate under the control of Rajasthan Knowledge Corporation Limited by Vardhaman Mahaveer Open University. 3. Working Knowledge of Hindi and writing Hindi in Devnagri Script and Knowledge of the Culture of Rajasthan. The candidate’s minimum age should be 18 years and maximum age should be 35 years. The age relaxation for the reserved category candidates will be based on the RSMSSB Rules. The basic Salary Pay Scale: Rs. 26,300/-. Applicants visit the official website of RSMSSB. Click on the Recruitment Advertisement button. Again click on the Apply Online Link. Fill the basic and personal details with correct information. Complete the Qualification & /experience fields. Upload the scanned photograph & signature in the prescribed format. Candidates can save or download the application form for further uses. 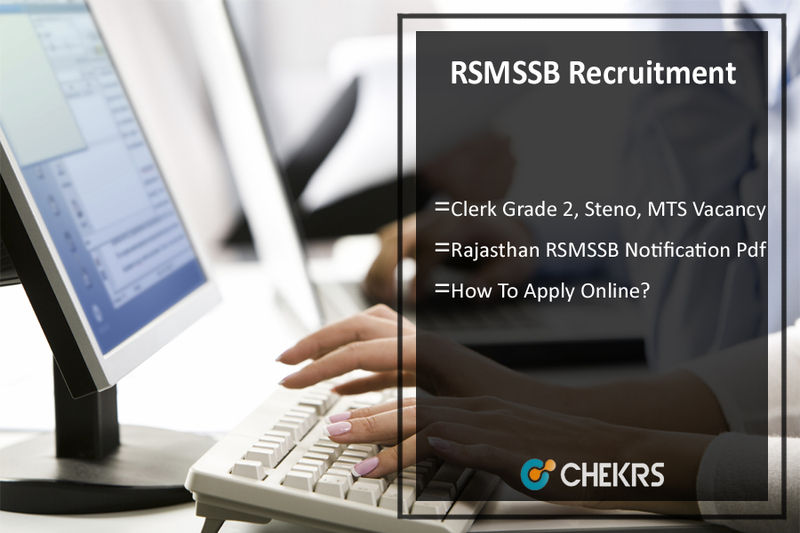 To receive more updates on RSMSSB Sanganak Recruitment 2019, keep visiting our site www.jobs.chekrs.com. In case of any query or review place, your valuable comment in the commenting section below and our team will revert you in a short while.